In early spring, we found a praying mantids nest in our shade garden plants. A group of praying mantis is known as a mantid. We watched the nest ball to make sure it actually was a praying mantis and not another type of bug. The rains started and the nest watch was postponed. 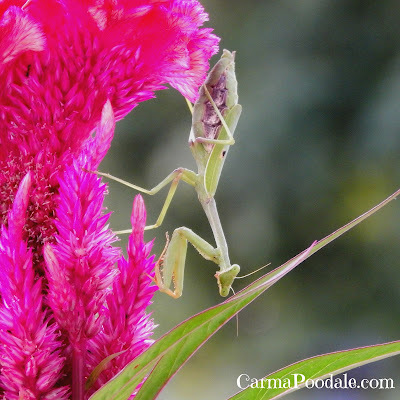 After the rains stopped, we were checking on the plants and pouring the water out of the potted plants when we spotted 5 tiny praying mantises. 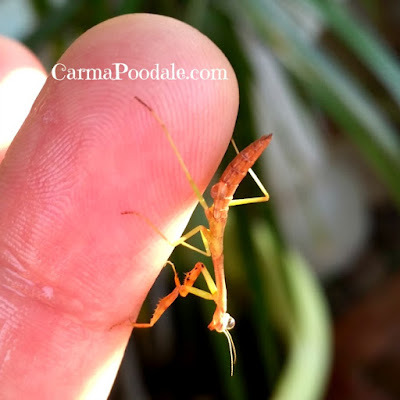 One of the mantises was super friendly, crawling on ma's finger. This made her happy considering praying mantis are beneficial bugs. We put the baby mantis on a houseplant and then we lost track of it and all the others. We are in the front yard weeding the front flower bed that sits in front of our frontroom window when ma looks up at the cockscombs and sees something looking at her. Upon inspection, we think it is the same praying mantis that was in the backyard. The nymph that was in the back had a black spot on one of the its wings. This one has the spot on its wing. Our mantis has became a source of entertainment for us. We watch her feed on insects and enjoy watching her walking on the plants. When she sees us she makes sure that we see her. They are fascinating to watch. Fact- Praying mantis are believed to be relatives of the cockroach and termite. Some entomologists group these insects in a superorder (Dictyoptera), due to their close evolutionary relationships. 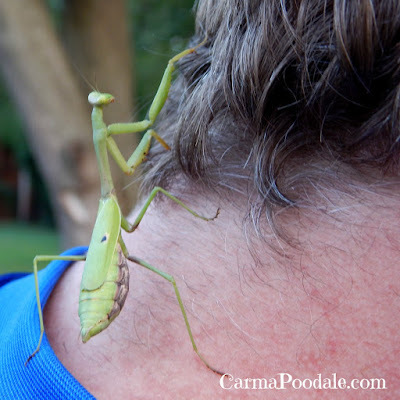 Fact- Praying mantis are one of the few bugs who can turn their heads 180 degrees. 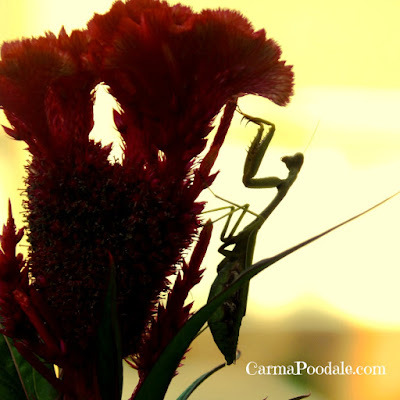 Fact- Female Praying mantis do not always eat their mates. Myth- It is a misconception that females always eat their mates head during mating. This is a fact when they are being studied in labs but in the wild it happens less than 30% of the time. Fact-The mantis was introduced to the U.S. from China in the late 1800's as a potential beneficial insect. It is no longer considered beneficial because it feeds on many desirable native insects, including butterflies and native praying mantids. The Carolina Mantid, Stagmomantis carolina, reaches about 2 1/2" and has a mottled appearance, with gray, white, black, and tan. It is the ONLY mantis native to Kentucky. Myth-According to a widespread myth, it is illegal to kill praying mantids in certain states. 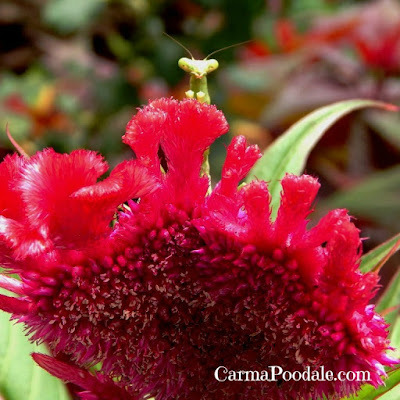 This is not true: praying mantids in the U.S. are not currently in danger of extinction, and are not protected by any specific laws. 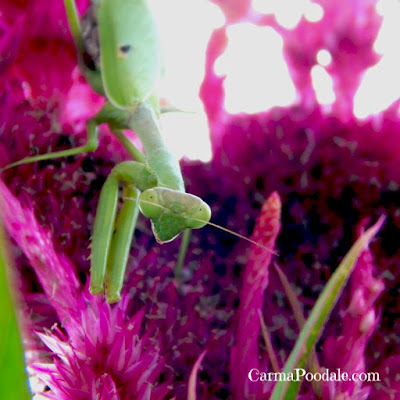 Fact- Though mantis are beneficial bugs because it eats bugs that may not be good for our gardens, they will also eat beneficial bugs such as bees. I hope you learned something new about Praying Mantis. Do you have praying mantis in your garden or ever kept one as a pet? ?